With the onset of of heavy rain this week it seems like winter has finally decided to pay a visit to the west coast. 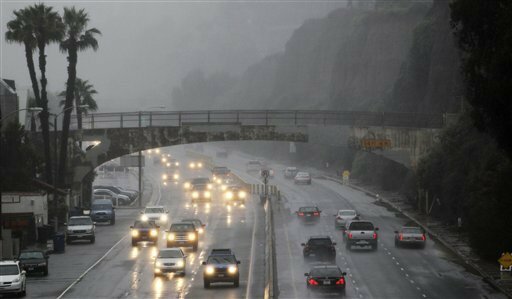 Rainstorms have rolled through many parts of the west coast this week. And it looks like we still have a few more days of wet weather ahead of us. When rainy weather sets in it is quite common for many people to experience plumbing problems associated with the rain. There are several reasons for this including excess debris causing clogs, soft ground, and clogged storm drains. Let’s look at the effect of heavy rain on your plumbing. One common effect of heavy rain on your plumbing is the potential for clogs. Running water tends to collect debris like leaves, branches, birds nests, and trash. As these items get swept away, they can start to collect in your plumbing causing clogs. If you notice slow drainage after heavy rains, it is a good idea to call your plumber to have your drains cleaned. Professional drain cleaning can help relieve some of the pressure put on your plumbing from heavy rainfall and get things flowing again. Another common effect of heavy rain on your plumbing is broken pipes from saturated ground. The problem with ground that is saturated from heavy rainfall is that the soil can start to shift, offering less support for pipes which can cause areas of weakness. Also as the ground shifts, rocks can make their way towards your plumbing pipes, which can cause damage. All in all, saturated, soft ground that starts to shift, is problematic for your plumbing and can lead to cracks, which can then become clogged with dirt and debris. If you notice the ground continues to be saturated even after the rain ends, you could have a problem. It worth the inspection to see what is going on. Clogged storm drains are common after heavy rains. Moving water often takes everything in its path with it. 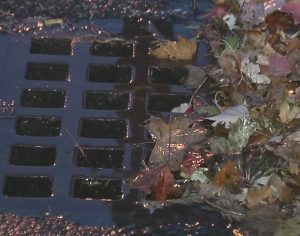 Things likes leaves and trash can often find themselves part of a clogged storm drain after it rains, which can cause issues with flooding. To prevent flooding around the house, make sure storm drains are free of any debris. In addition to making sure storm drains are free from clutter, it is also important to make sure that gutters and downspouts are also clear and in good condition. Gutters and downspouts are important for proper diversion and drainage of excess water. Water that isn’t diverted to storm drains, can cause flooding issues and damage to the foundation. It is also important to note, that whatever goes down the storm drain can eventually end up in our lakes, rivers, streams, and oceans. So watch what goes down the storm drain. Sump pumps are also important when it comes to removing excess water. While many homes on the west coast do not have basements, the ones that do should have a working sump pump. Sump pumps turn on when water enters the crock. Once engaged they pump the water out of the area and to an outside drain. Once a year it is a good idea to check the sump pump. Pour water into the crock and make sure it turns on. If something isn’t right have it repaired or replaced before heavy rain sets in. For more information on the effect of heavy rain on your plumbing or to schedule service, contact Rooter Hero today! We have locations throughout California and Arizona and are available 24 hours a day 7 days a week!